Antibody was affinity purified using an epitope specific to Phospho KAP-1 (S824) immobilized on solid support.Immunogen was a synthetic phosphorylated peptide, which represented a portion of human KRAB-Associated Protein 1 surrounding Serine 824 according to the numbering given in entry NP_005753.1 (GeneID 10155).Immunoglobulin concentration was determined by extinction coefficient: absorbance at 280 nm of 1.4 equals 1.0 mg of IgG. 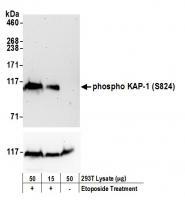 Detection of human Phospho KAP-1 (S824) by western blot. Samples: Whole cell lysate (15 and 50 µg) from HEK293T cells treated with 100 µM etoposide (+) or mock treated (-). Antibodies: Affinity purified rabbit anti-Phospho KAP-1 (S824) antibody A300-767A (lot A300-767A-4) used for WB at 0.1 µg/ml. Detection: Chemiluminescence with an exposure time of 30 seconds. Lower panel shows western blot for total KAP1-1 using affinity purified rabbit anti-KAP-1 antibody A300-274A at 0.1 µg/ml with an exposure time of 30 seconds. 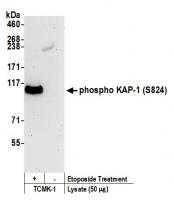 Detection of mouse Phospho KAP-1 (S824) by western blot. Samples: Whole cell lysate (50 µg) from TCMK-1 cells treated with 100 µM etoposide (+) or mock treated (-). Antibodies: Affinity purified rabbit anti-Phospho KAP-1 (S824) antibody A300-767A (lot A300-767A-4) used for WB at 1 µg/ml. Detection: Chemiluminescence with an exposure time of 3 minutes. 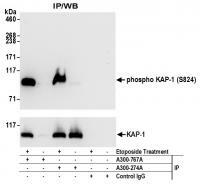 Detection of human Phospho-KAP-1 (S824) by western blot of immunoprecipitates. Samples: Whole cell lysate (1 mg for IP; 20% of IP loaded) from HEK293T cells treated with 100 µM etoposide (+) or mock treated (-). Antibodies: Rabbit anti-phospho-KAP-1 (S824) (A300-767A lot 4) and rabbit anti-KAP-1 antibody A300-274A used for IP at 3 µg/mg lysate. For blotting immunoprecipitated Phospho-KAP-1 (S824), A300-767A lot 4 was used at 1 µg/ml. To examine total KAP-1, the blot was stripped and then blotted with A300-274A at 1 µg/ml (lower panel). Detection: Chemiluminescence with an exposure time of 10 seconds (upper) and 3 seconds (lower). Detection of human Phospho KAP-1 (S824) by immunocytochemistry. Samples: NBF-fixed asynchronous HeLa cells grown in chambered microscope slides and treated with etoposide (left) or untreated (right). 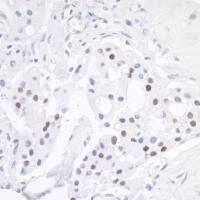 Antibody: Affinity purified rabbit anti-Phospho KAP-1 (S824) (Cat. No. A300-767A Lot3) used at a dilution of 1:200 (1µg/ml). Detection: Red fluorescent Anti-rabbit IgG-DyLight® 594 conjugated used at a dilution of 1:100.